The New Women's Cool Vest™ is IRONWEAR®'s coolest design created for hot weather workouts. The Women's Cool Vest™ was developed for walking, hiking, and jogging and is a great way to increase strength, endurance, and bone density. Every aspect has been designed to make wearing a weighted vest as cool, safe, and comfortable as possible. The New Women's Cool Vest™'s unique design has a heavy duty front zipper which makes it easy to put on and take off the vest. 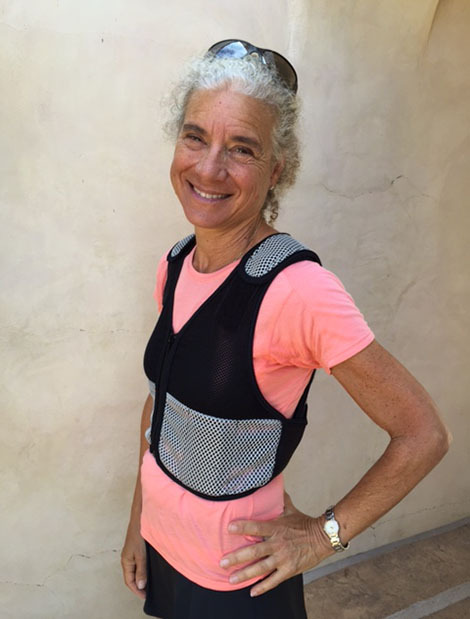 The Women's Cool Vest™, unlike standard weighted vests, does not require lifting the vest above the head to put it on, which is often very difficult as the weight is increased. 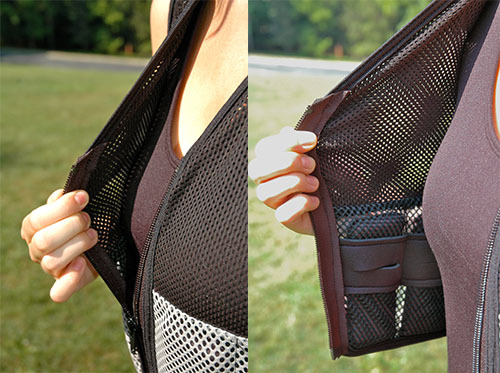 The Women's Cool Vest™ is designed to allow air to flow easily through the shell and the wearer. Silver mesh is used to reflect the rays of the sun and the mesh has oversized holes for rapid release of heat as air passes through. The Women's Cool Vest™ has a special porous stretch mesh chest area to allow air to pass and heat to be extracted from the chest area. This special feature is only available on the Women's Cool Vest™. The Women's Cool Vest™ fits a wide variety of cup sizes and waist measurements. The adjustable belts are in the back and can easily be set up the first time the vest is used. We recommend that you have assistance to adjust the straps for the initial use, after which no adjustments are normally necessary, just put it on and zipper it up. The Women's Cool Vest™ contours to all the curves of the chest and back. The breast area is unweighted for optimum comfort. The shoulder straps are height adjustable to properly fit any chest size while the unique padded belting system acts as a back support to help strengthen your abdominal muscles and improve your posture. Every part of the Women's Cool Vest™ bends with you as you move, from the soft stretch mesh front to the soft Flex-metal® weights. Even the edges of the vest are bound with soft material to stretch and move with you. 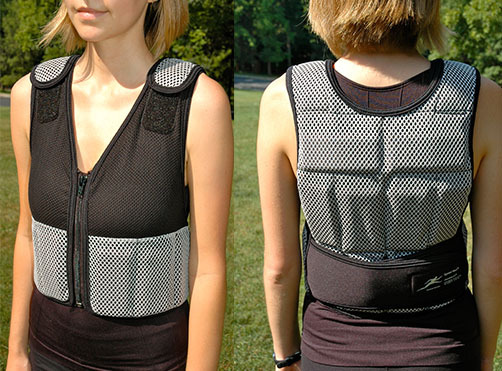 The Women's Cool Vest™ includes two overlapping padded belts which attach in the back. These soft stretch belts hold the front weights snuggly against your abdominal and back muscles and stretch to allow you to breath comfortably. First adjust the shoulder straps so that the abdominal weights sit flat just below your chest. By locking the abdominal weights under the chest, the weights on the back can be used to lift the chest. 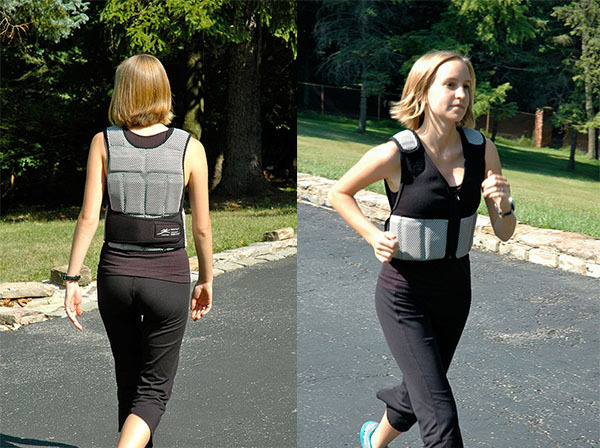 This allows the vest to be used to help counteract the disproportionate weight on the front of the woman's body versus the back. 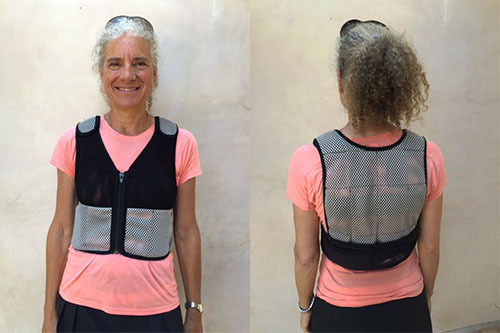 The Women's Cool Vest™ can be weighted with more weight in the back than in the front, which can help to pull back the shoulders and lift the chest for improved posture. ★★★★★ Thanks so much for replacing my Women's Vest shell with the Women's Coolvest shell and doing it so quickly! Three days out of the box, in use everyday, and I love it! The fit is so much better for me, and the fabric is great. It's terrific work you are doing.